I really like how these cards turned out, they have a great vintage feel to them and are a little more muted than the bright greens I've used in the other cards. I used the same techniques in both cards. Starting with a white base card I added a rectangle of the Anna Griffin paper, it's a pale green that has a fabric look. Using the green ink pad I rubbed it over the edges of the cards, when that was dry I used a pale green blending chalk to soften the edges of the card. I then rubbed the chocolate brown ink over the edges of the card to give an antique look to the card. I repeated these steps of ink pad, blending chalk, ink pad for all the paper and card elements that I added. For the flourishes I stamped them in green first then over stamped them very slightly off register in the brown, this gives an interesting shadow effect and adds depth. For the card on the left I cut out the fancy square shape/ tag from a template. 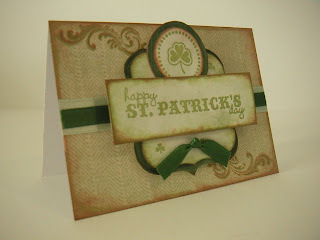 I cut one in white (I stamped little shamrocks on this) and one slightly larger in dark green card. I added two strips of ribbon to the card across the centre, then using foam pads added the squares. 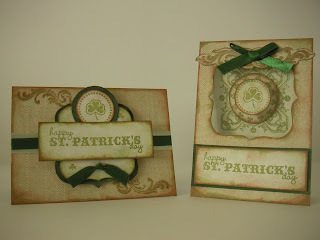 I then stamped the text and shamrock on separate card cut these out and added them to the card. To finish I glued a piece of tied ribbon to the square. On the second card instead of adding the fancy square I cut the shape out and put acetate behind it to create a window. 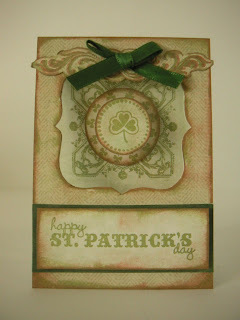 On the inside of the card I stamped a medallion in green then I added a circle of shamrocks on another piece of card. The single shamrock is actually on the outside of the acetate on the front, it creates a nice layered effect. I stamped the flourishes on card and cut them out, I added these to the top of the card. I glued a bow in dark green on top of this. I stamped the same text as before on a piece of card backed in the darker green card. Studio G Designer clear stamps, Studio G stamps Janet Dunn, Laurence Llewelyn-Bowen Venaissance. Anna Griffin Decorative Impressions Old Paris Palette. Versa Magic chalk ink tea leaves, Ink it Up Chocolate brown.